Summer means one thing: time to head out RVing with the family, enjoying hiking, biking, barbequing, and making s’mores around the campfire. 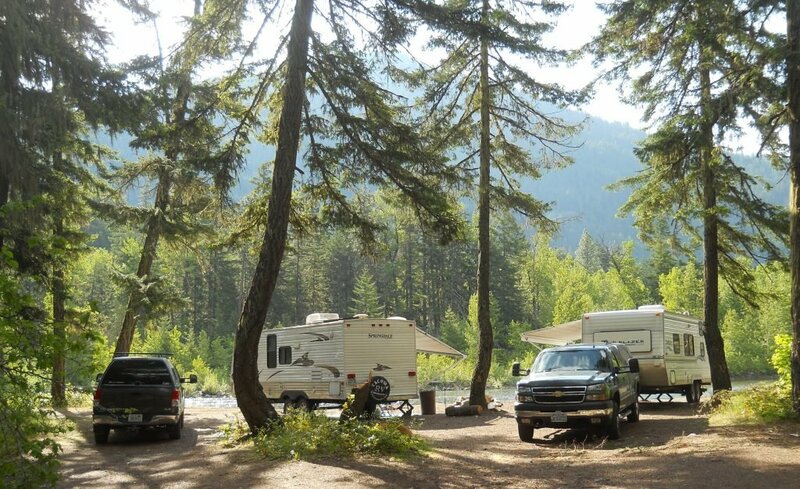 However, nothing can take the fun and adventure out of your RV campout quicker than the buzz and bite of mosquitoes in and around your site. While no precautionary measures can guarantee a bite-free experience, there are things you can do to keep your encounters with these pesky bloodsuckers to a minimum. Don’t let mosquitoes keep you from enjoying a campsite like this. Avoid any campsites near standing water, which is where mosquitoes breed. Mosquitoes love to rest in tall grass and on the undersides of leaves. Therefore, that shady campsite that looks so inviting is probably a sanctuary for the bloodthirsty critters. Try to find a campsite that minimizes places for them to hide. According to insect experts, mosquitoes aren’t active when wind gusts exceed 10 miles per hour, so set up your camp in an open area that gets a good breeze. The clothing you wear is your first line of defense against mosquitoes. The insects are drawn to body heat and the carbon dioxide (CO2) you exhale. Covering your skin with long pants and long sleeve shirts, along with a hood or hat, in light colors that reflect heat makes it harder for them to find you. Clothes produced from polyester or woven nylon are thicker and therefore are better protection than cotton or other thinner fabrics. The hours around dawn and dusk seem to be the time mosquitoes are most active. Plan inside activities or ones that keep you away from your campsite during these times. A sunset walk is always a great alternative to sitting in camp at dusk. It is also worth noting that mosquitoes are not active below 50° F.
Try the age old recipe of two household baking ingredients to keep mosquitoes away. To ward off mosquitoes, mix two teaspoons of pure vanilla extract and one cup of water in a trigger-spray bottle and mist yourself with the fragrant solution. In the United States, citronella oil is classified as a biopesticide with a non-toxic action which repels mosquitoes. Several lit citronella candles around camp typically are sufficient to deter them. We have all covered ourselves and children with “bug spray” and it is still one of the most effective methods for fending off all types of biting insects. DEET is one of the most effective chemicals known and is found in many RVers cupboards. Depending on the level of DEET in the bug repellent you purchase, it’s typically effective for a couple of hours or more. The higher the concentration the more effective it is, so if you are in a high density mosquito area buy repellent with a higher concentration of DEET. Be sure to follow the manufactures directions and heed their warnings. Permethrin is another remedy. It’s an insecticide that can only be used on clothing and camping gear and is long lasting. You can buy it as a spray which you can apply to your own clothing and gear to repel and kill mosquitoes, ticks, chiggers and other pests. Permethrin-infused clothing is also an option with some manufacturers promising effectiveness for the life of the garment. By utilizing the tips above you can get out there and enjoy summer camping while minimizing the annoyance of pesky mosquitoes. Dealing with mosquitoes, just another adventure in RVing! Read more about keeping mosquitoes away this season. good but already known of course i am from the old school. what can you use fore nats around your eyes and ears? Use dryer sheets in your shirt pocket. These also work for mosquitoes. Also, using the Avon product, “Skin So Soft” will also ward off gnats and mosquitoes. Have you or anyone you know tried the Therma cell products? These products heat small pads infused with insecticide or citronella, I’m not sure which one, with butane or battery power. I am sure there are other companies making similar products Therma cell is just the one I remember. We used a Thermacell for one season and were NOT impressed with it at all. Save your money. We use thermacell and love it! We always know when the sheet needs replacing because the skeeters return! Find an Avon Rep and bathe with SOS (Skin So Soft) Soap and the squitos won’t like you-at least in hot humid south Texas. I’m originally from Minnesota. It states above that mosquitoes are not active at 50°. I have been Deer hunting with snow on the ground and it was around freezing and I saw them land on the snow and sit for a time ,then fly away. I observed this several times in different years. Yes it surprised me each time I saw it. I’m sure other Minnesotan’s can verify this. We like wondercide products. Biter fighter for people they have stuff for pets and we spray outdoor product around rv. It’s all made from cedar oil, non toxic, great smelling and works.